To kick Droid Life and NVIDIA’s Two Weeks of Holiday Tegra, we thought we would start with Asus’ other Tegra 2 tablet, the Eee Pad Slider. It’s all of the goodness you want and expect from the original Transformer, but with a sliding keyboard attached. You will find a dual-core Tegra 2 processor, 1GB of RAM, a beautiful 10.1″ display, dual cameras, and all of the hot ports including HDMI. Yep, it’s a winner. Congrats Eric! And must I say, “Holy 3,800 entries in about 5 hours time.” You guys are the best. Nine more tablets to go! 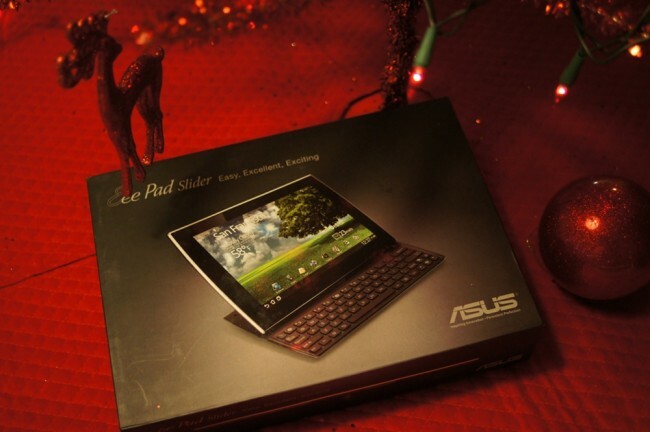 1 (one) Asus Eee Pad Slider tablet. 3. In the comments, tell us what your favorite holiday tradition is. At 6PM Pacific, we will randomly chose a winner from the comments. This post will be updated, comments closed, and the winner notified. Prizes will be shipped at the end of the week. Good luck everyone! And be sure to check back in just over 5 hours for the winner.